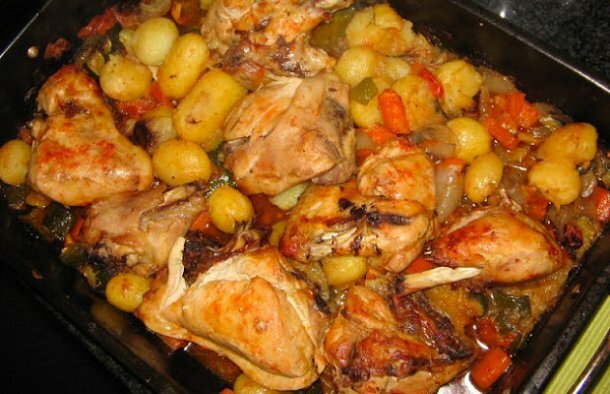 This Portuguese roasted chicken with vegetables recipe (receita de frango assado com legumes) is not only delicious, it is also very easy to make. 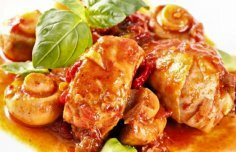 Season the chicken pieces with the garlic, bay leaf, salt, chili pepper paste and set aside. In a tray, add some olive oil to the bottom of it and add the vegetables on top. Season with a little salt and drizzle with some olive oil. Over the vegetables, place the chicken and drizzle a little more olive oil. Pour the ½ glass of wine and the ½ glass of water over it. Let it cook and from time to time turn the chicken so it cooks on both sides. When the chicken starts gaining color, add the potatoes. It should take about 50 minutes to cook the chicken. 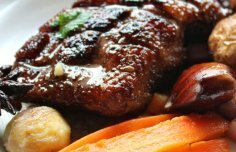 How to make Portuguese duck with chestnuts (pato com castanhas). 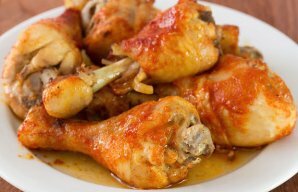 How to make Portuguese stewed chicken.